If you didn't create a multi-page form with the Form Wizard, you can convert your single-page form into a multi-page form. 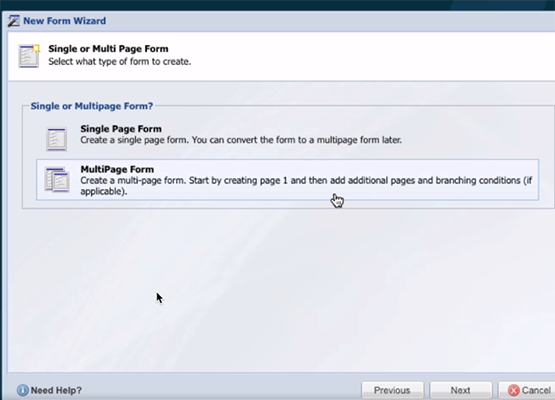 All of your form elements will be added to page 1 of a new multi-page form. Then you can add pages to your form and move your fields around. In the Form Designer menubar, click Settings > Convert to a Multi-page Form. In the dialogue box that displays, click Yes to confirm your choice. It will take a few moments for the system to prepare your form for multi-page use. When the conversion is complete, you'll see all your form elements in a new "Unnamed Page". To change the name of the first page, click on the "Unnamed Page" item in the list, then find the Page Name property in the Page Properties panel, and edit the Value. For example, you may want to call it Page 1. You can insert a new page before or after any other page on your form. To insert a new page before or after an existing page, right click on the page node in the Form Outline Panel and choose Insert New Form Element > Page > Insert Before / Insert After. This will insert a new page at the selected position. You can also append or prepend a page to the form, by right clicking on the root form node and choosing Insert New Form Element > Page > Prepend to form / Append to Form. New pages added to your form will automatically include a next and back button. If the new page is intended to be the final page on the form, you will want to adjust the button label to read "Submit" instead of the default "Next". To move a page, drag it to its new position via the Form Outline Panel. If you need to move a page to be the last page on the form, you must first ensure that the current last page node is not expanded. If the last page of the form is expanded in the Form Outline Panel you will not be able to drag and drop a new page to the last position. You can duplicate a page, including all of page's child elements, by right clicking on the page and choosing Duplicate. To delete a page, click on any page but the first page, right-click and choose Delete Selected. Be careful about deleting a page that is referenced in another page's conditional branching logic. Doing so may introduce errors into your form. Note: You cannot delete the first page. Instead, you can reposition the first page to be the second page (by drag-and-drop), and then delete it.